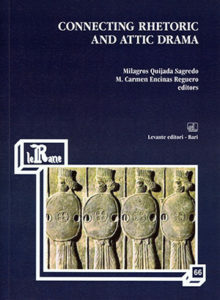 CONNECTING RETHORIC AND ATTIC DRAMA – Levante Editori S.r.l. An approach to the study of Greek theatre from a critical perspective which takes into account the contributions of the theory of formal discourse, that is, rhetoric, and its actual practice, oratory, offers multiple possibilities. Both from a theoretical perspective and from the praxis to which rhetoric provided an answer, the connections between theatre and rhetoric were abundant in the Greek case. We might say that both of them became a substantial part of the Greek cultural panorama associated to the consolidation of the democratic state, and particularly of the Athenian polls. In the work we present here, the focus is placed on some aspects of research related to the study of Greek rhetoric and theatre, connecting them from the points of view of tragedy and argumentative logic, figures of rhetorical argument and poetics of emotional persuasion, tragic structure and legal procedure, rhetoric and politics. The volume contains ten studies, nine on Greek tragedy and one on ekphrasis in Greek comedy, and it pays attention to works which are preserved in a fragmentary state, including post-classical tragedy. Scholars from various European universities and the University of Michigan participate in this work, which has been carried out within the development of a research project on Greek Rhetoric and Theatre. The project has been active in the past years and is directed by Professor Milagros Quijada Sagredo, from the University of the Basque Country (Spain).